Located in Perama, Alexandros Villa offers a terrace with sea and mountain views, as well as an outdoor pool, hot tub and hammam. This property has free WiFi. The villa comes with 4 bedrooms, a fully equipped kitchen with a dishwasher and an oven, and 2 bathrooms with a hot tub. A flat-screen TV is offered. Pontikonisi is a 17-minute walk from the villa. The nearest airport is Ioannis Kapodistrias Airport, 4.5 miles from the property. When would you like to stay at Alexandros Villa? This villa has a toaster, private pool and bathrobe. House Rules Alexandros Villa takes special requests – add in the next step! Please inform Alexandros Villa of your expected arrival time in advance. You can use the Special Requests box when booking, or contact the property directly using the contact details in your confirmation. We need at least 5 reviews before we can calculate a review score. 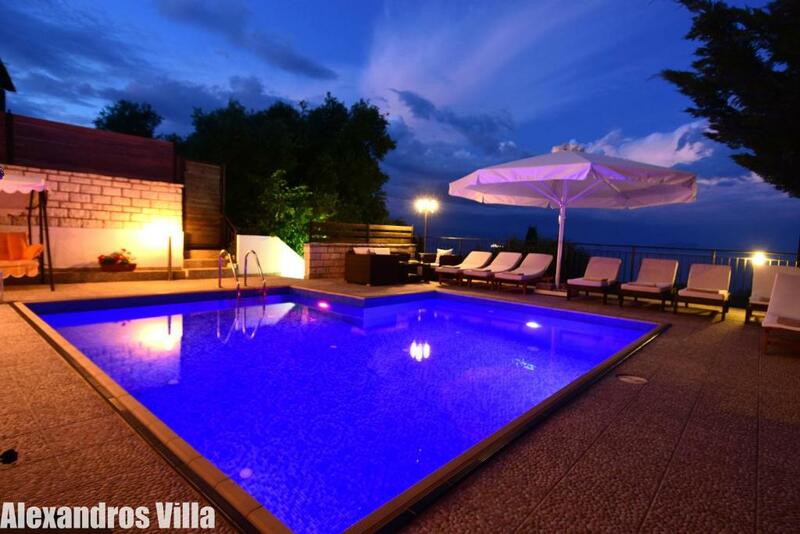 If you book and review your stay, you can help Alexandros Villa meet this goal. Beautiful villa, immaculately clean and the owners have thought of everything you would need on holiday. If you don’t have a car they will organise taxis for you as it is a little too far to walk to restaurants and shops. The location close to the airport affords you views of be airplanes coming in to land. Close but not disruptive. The beds are extremely comfortable and the rooms air conditioned. I can’t rate this more highly. Friendly and very accommodating. Nothing was too much trouble. Our hosts thought of every little detail, from fresh fruits and drinks to spare towels, kitchen utensils, cleaning tools and personal care products. The house was very clean, well equipped and looked exactly like in the pictures. Of course, the best part was the location, pool, and view. Corfu is simply an amazing destination for couples and families.